Hi. I’m Cyndi Allison. 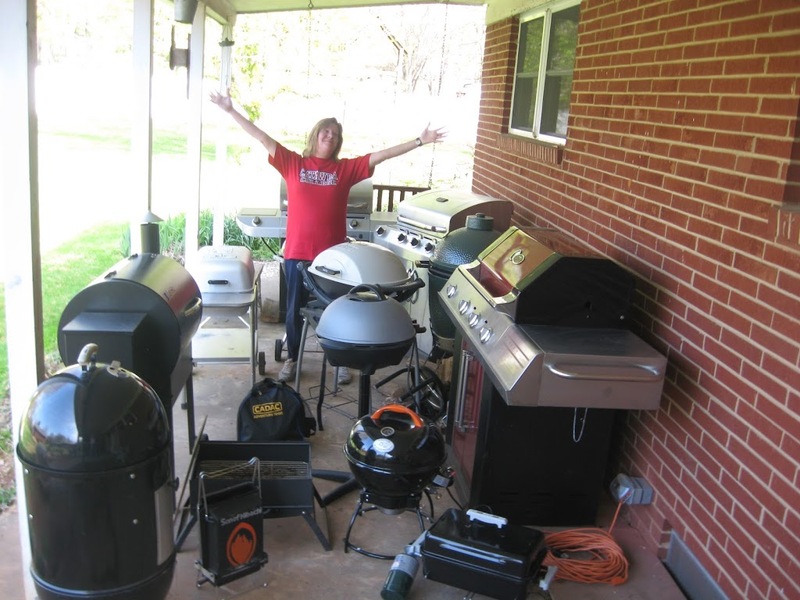 You may know me as Barbecue Master from my blog or Grill Girl from my web site. I’m a freelance writer and write all kinds of articles. You aren’t as likely to see my technical and grant articles and likely would not enjoy those pieces, unless they are in your field. 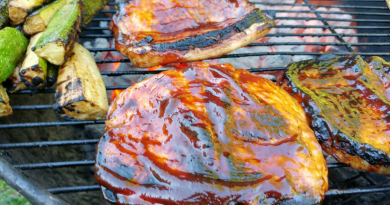 Grilling was my hobby, and I started the blog to help home grillers, but I’ve been hired to do professional writing about grilling and barbecue. This summer I’m blogging about grilling for Sears and McCormick. I also wrote the grill pieces for Consumers Digest in 2006 and 2011 and the hotel coffee table book piece on North Carolina Barbecue for the RTP area (editor’s pick for that edition). Right now I live in North Carolina which is where I’ve spent the bulk of my years. I’ve also called Virginia and Texas home as well as Greece and Japan. Living in different areas has influenced my grilling, so I mix flavors in various ways based on what I’ve seen and eaten across the world. I have between 20 and 30 grills and smokers, and I’m too lazy to walk around the house, porches, and garage and count at the moment. 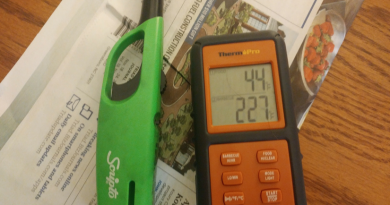 I rotate on different types of outdoor cookers, so I can help most people who ask questions. Family members borrow the grills, so the number varies from month to month. How long have you been barbequing? My Dad put me out to grill when I was about 12 years old. You could do the math if I gave you more information. Let’s just say that I’ve been grilling a really long time. After I caught Pop Tarts on fire in the toaster, I was assigned dish washing inside and could play with fire outside. Do you cook for: Family/Friends, Competition/Festivals, and/or Catering? If Competition: Which one(s), Year, list any awards. I’m kind of an odd bird in barbecue. I don’t do competitions or cater, and I don’t want to be a chef. I’m a writer. That’s what I do. I can share the experiences and can give detailed and careful directions so that others are successful on the grill. I grill and smoke for my family and friends and small groups, although I’ve done tailgates standing at the grill for six hours straight. When I’m on the grill for extended times like that, then I can’t get the stories and the photos. Also, I hate sleeping outside and using Port-a-Johns, so I would be a cranky competition player. I’ll stay up late getting information at competitions and spotlighting other smokers, but after about 1 am, I want a bed and then a hot shower in the morning. 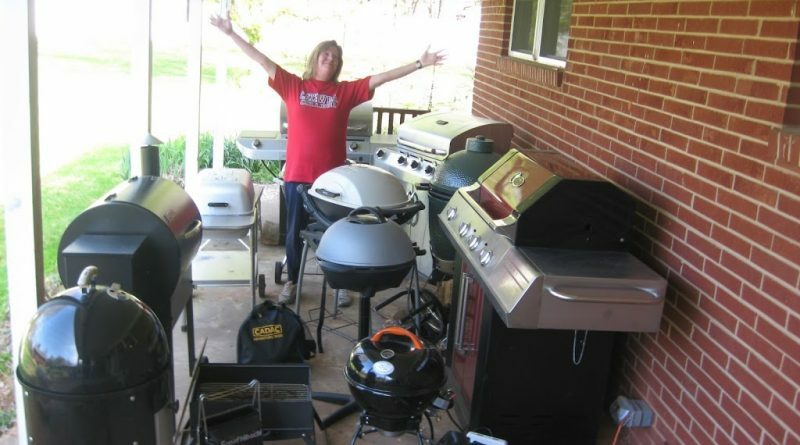 Is there another BBQer that has inspired you or, gone out of their way to help? Who was it and what happened? As you can gather, my Dad was not a “hands on” kind of teacher. He was an engineer, and he would tell you the basics in very technical terms and assume that you understood what he said. I was the cussed kind of kid who would nod my head like I got it all and then say I must have been standing too close to the grill when I fried the ends of my hair. We both mellowed with age and stopped butting heads by the time I was thirty or so. He was a fabulous grandfather to my boys. We made our peace and were close and grilled and did lots of other things before his death six years ago in a truck wreck on I-77. I share that, because I’m sure others out there may not see eye to eye on everything with family. I’m just fortunate that we both came to accept our differences and to cherish each other and a common love of some things like grilling. What do you like most about cooking barbeque? I really like everything about cooking outside – whether it’s barbecue or just burgers and hot dogs. It feels like a party when you fire up the grill, and the boys are more likely to help if it’s outdoor cooking. When my stove went out, we ate off the grill for six months before I replaced it. No big deal. We could make it outside, so we did. I do have a stove inside again now. Your favorite cut of meat to cook, Why? It’s hard to pick a favorite cut of meat, because if it’s done well, I can’t think of any cut I don’t like. I suppose if I had to pick one last meal grilled, then I’d go with rib eye steaks. That was my Dad’s specialty, and he would do those on my birthday. My favorites on the side depend on whether I’m doing a full meal on the grill or if I’m rotating in and out of the kitchen. On the grill, it’s hard to beat corn on the cob or summer vegetables in the wok with a spicy marinade. Inside, I love my Grandma’s chilled broccoli salad (which I can’t get the boys to eat) and meaty baked beans with Frank Corriher sausage (which is local). I’ve had the glory of trying so many wonder barbecue sauces that it’s hard to call one out. I must admit that I’m partial to Nephew’s out of Raleigh, NC. The Cherry’potle BBQ Sauce is fabulous on ribs. It’s sweet but not overly so and has a little heat but not eye watering. That punch of cherry just puts it at the top of my list, and my boys ask for that one specifically. I try to stay neutral and do love many of the small batch sauces I’ve tried, but Nephew’s does top my list. With rubs, I also find there are a huge number of great ones and especially the small batch makers who usually just sell online for now. If I could only have one barbecue rub in the house, it would be Dizzy Pig. The basic Dizzy Dust is excellent on meat or vegetables, and I love the variations like the Red Eye Express Rub Spice which has a hint of coffee infusion. When it comes to charcoal, I go against the current grain and prefer briquettes. The lighter flavor of natural lump and pellets are nice, but I grew up with that Kingsford flavor and crave it. I’m not too happy that Kingsford made their charcoal burn hotter though, so I often use store brand briquettes now. If I don’t have my own wood (which I usually do), I think Baxter’s wood is the best. I love the faint zing of the pecan and fruit tree woods, but they do burn up fast. So, I use hardwoods too. It really depends on what I’m smoking. With fish, I go with a fainter smoke flavor while heavier on butts or ribs. A funny story related to barbeque? I was hired to test and rate barbecue grills. I live in a small town of 820 people with little roads. The first 18 wheeler around my block knocked down the cable line (not a good thing in a town with no entertainment). After that I’d tell the drivers to call at the corner. Then, I’d get the kitchen stool and broom and go stand on the stool and hold the cable line high enough with the kitchen broom for the trucks to pass under. The neighbors still don’t know I write about barbecue and grilling, so I’m sure they wondered about that and also about all these grills on my porch. Any advice for people new to barbeque? Read up on grills and smokers and get one that matches your style. If you want “quick and easy,” then get a gas grill or convection style grill. 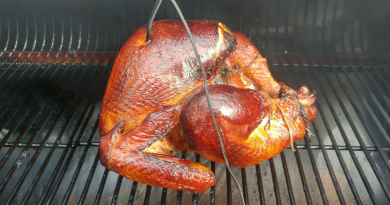 If you like to putter outside and work with the food and crave flavor, then you’re going to be happier with charcoal and/or a smoker or a combo type. It’s like picking a vehicle. Some people want a truck and others want a sports car. Or, a four-door sedan may be the ticket. If you get the right outdoor cooker, you will have hours of fun. Don’t just walk in and buy a grill off the floor, or you may have a Harley on the porch when you actually needed and wanted a SUV. Cyndi was our favorite writer at Brenau's Barbecue Championship. She may not have done competitions, but she was at ours. A great time was had by all.